Living with tooth loss is no easy task. With each missing tooth, your ability to chew and speak declines while your confidence also suffers. Unfortunately, there are larger complications brewing beneath the surface. Your jawbone is slowly deteriorating because there is no longer a root in place to stimulate it. You do not have to live with the consequences of missing teeth. 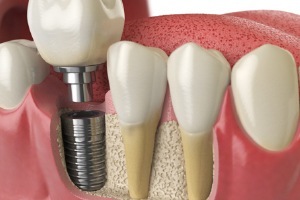 Dr. Marc Thomas has the solution you need with dental implants in Sparks. Your treatment process will involve multiple phases to ensure the long-term success of your new smile. If you have good oral and general health, you are a candidate for dental implants; however, you will require a thorough consultation. In addition to evaluating your dental health, Dr. Thomas will discuss your medical and lifestyle history to look for any potential issues that could lead to late-term implant failure, like immune disorders or smoking. Diagnostic images are needed to assess the health of your jawbone. 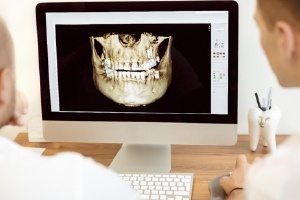 Dr. Thomas will take digital x-rays and use CT scans to gain a complete picture of your oral structures. Based on the information, he may recommend you undergo additional procedures prior to having the posts placed, such as tooth extractions, bone grafting, or a sinus lift. 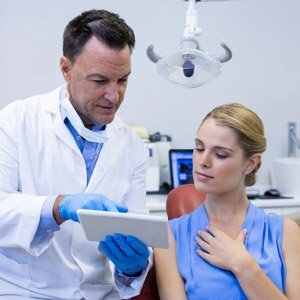 Using the previous scans and computer-guided technology, Dr. Thomas can pinpoint the ideal location for your implant posts. To insert them into your jawbone, you will require surgery. Anesthesia or sedation are used, so you do not need to worry about feeling any pain or discomfort. Your gum tissue will be opened to expose your jawbone. Small holes will be drilled into it allow the posts to be placed. Finally, your gum tissue is sutured closed and the healing process will begin. Over the next few weeks, new bone growth is stimulated, and your jaw will fuse to the posts. Once your jawbone has healed, you will need a second minor surgery to place your abutments. They act as connector pieces for your custom-made restorations to be attached to the posts. During the procedure, your gum tissue is opened to give Dr. Thomas access to the implants. After the abutments are positioned, your gum tissue will heal around them to create a natural-looking gum line. To fill the empty spaces in your smile, digital impressions are needed to design your restoration, such as a crown, bridge, or denture. It will be created with accuracy to meet your exact needs. Using high-quality, durable materials, it will last for several years with the right care, like maintaining your oral hygiene. It will also look natural, so no one will be able to tell that they are not your real teeth. Dental implants allow you to make a long-term investment in your daily life because they have the potential to last forever. If you are ready to complete your smile with a successful solution, contact our office today to schedule your consultation with your dentist in Sparks.